Adding a hollow (aka. Oxford hollow, tube) is often used to repair books that originally had a hollow, which makes sense. 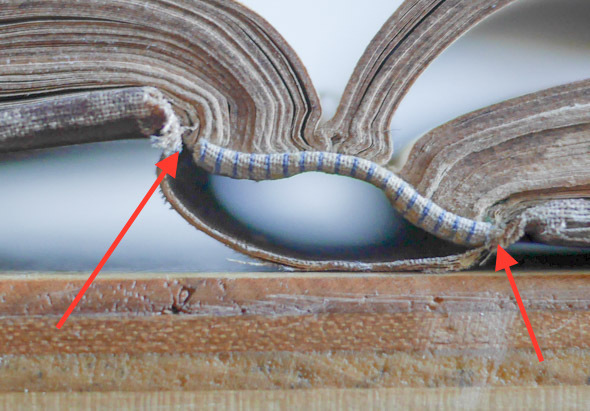 What makes less sense is using it on books that originally had a natural hollow, like case bindings. It adds at least three layers of paper, and only adds the strength of one thickness of paper. Admittedly, a strong sheet of handmade paper can be incredibly strong. Adding a hollow can dramatically change the opening, sometimes in unexpected ways. Often other hinging options with airplane cotton, linen or stout tissue are preferable. 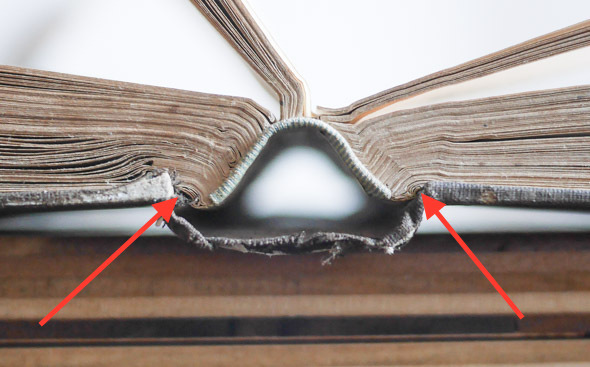 Adding a hollow is best suited to a quick and fast repair of circulating collections, or on relatively recent bindings with strong covering cloth. There are times when it should not be used. The movement of the spine would not be significantly changed by the addition of a hollow, since the textblock hinges from the tip of the shoulder. Remember that he significant stiffing caused by the adhesive and paper of the hollow is not addressed here, it also changes the movement, and can be damaging to a fragile covering material or spine linings.. The movement of the spine would be significantly changed by the addition of a hollow, since the textblock hinges from the base of the shoulder. The changes in movement can cause severe stresses to the covering material and spine lining, possibly resulting in creasing, tearing or even failure. Remember that the stiffing resulting from the hollow can also cause damage by significantly changing the movement. 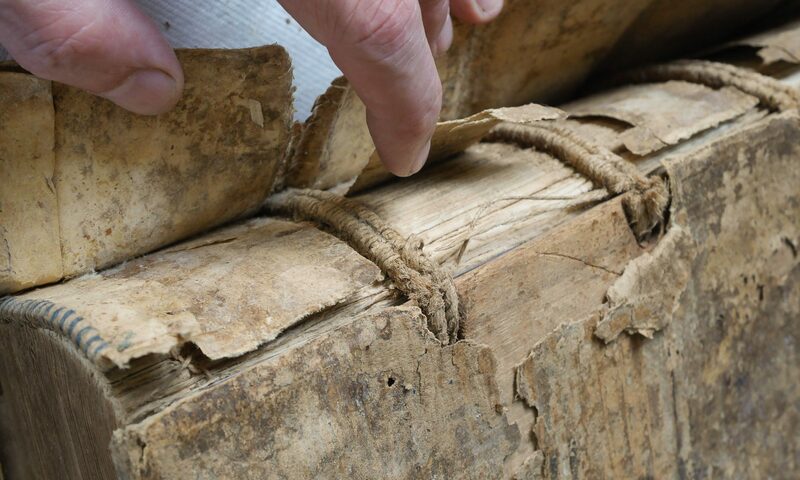 Because of the interaction of the case, spine linings and hinging points, cloth case bindings are sometimes more complex to successfully conserve than leather bindings. 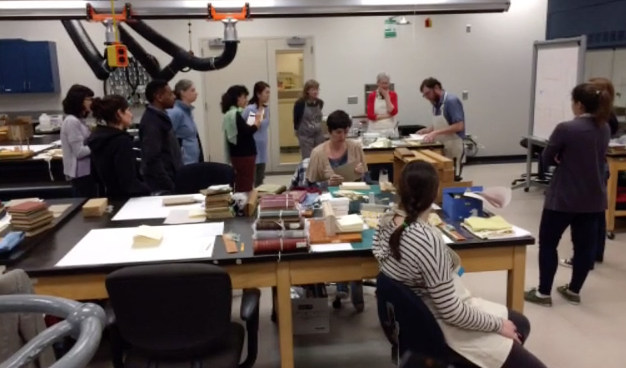 Georgia Archives Conservation Lab. Photo Kim Norman. Click on the links to see a slide show of images from each day. Images courtesy Kim Norman, Preservation Manager and Conservator, Georgia Archives. Thanks for hosting, Kim! There is talk of scheduling a complementary workshop in October 2017 at the same venue, dealing with rebacking, board attachment and repair of 19th century leather bindings. This would include leather paring with English and French knives, spokeshaves and the Scharffix paring machine, as well as methods of consolidating and dying leather. Check this blog for more info as it becomes available. Hi Jeff. An nice series of stills. You and all the lasses at the workshop clearly enjoyed yourselves. There is the notable absence of men (except you). Yes, generally there are about 10% men in a given bookbinding class I’ve taught or taken. The male in this class (out of 13) canceled. Please join us next year! Thank you so much for the slide show! I took this class from you at North Bennet Street School in 2010. I was just reviewing my notes today and wishing so much that I had pictures. Maybe some day you will make a video – you have so much to share. Thanks, I should do a video at some point….another thing to learn how to do!